Queen's University Researchers have developed a revolutionary tablet. The tablet is just as thin as a sheet of paper.It can be twisted and dropped without any damage. It was unveiled at International Consumer Electronics Show (CES 2013) in Las Vegas on Jan 8,2013. Researchers in Queen's University in Canada, along with Plastic Logic and Intel Labs developed it. 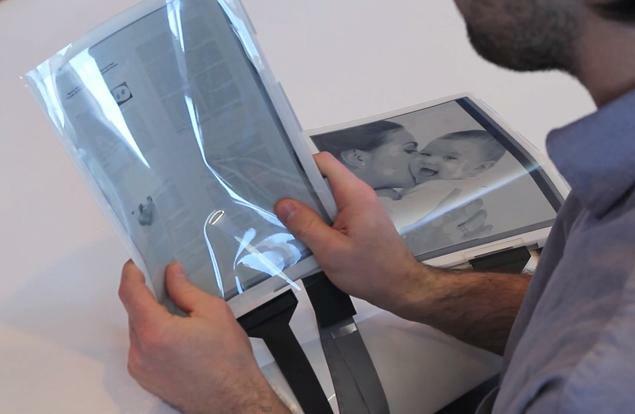 It is called as Paper Tablet or flexible e-paper touchscreen. It is more interactive and has high-resolution. The plastic display is 10.7 inch touchscreen. Its more flexible. It is supported by the second generation Intel CoreTM i5 Processor. It looks great and the sharing techniques are interesting. We can transfer the files to other tablet just by making a touch with the other tablet. To work with multiple documents it will be make a easy way. This Paper tablet is expected to reach everyone in five to ten years. By using this we can avoid carrying print outs and it is expected to replace all the other alternatives in this current trend. If you like the post, like us and comment your views on this post.